Add your branding to emails and pre-define discussion content using discussion templates. Discussion templates let you set up a collection of templates that you can insert when creating discussions in Current RMS. Add pre-defined text – perfect for saving commonly used messages or your company’s signature. Brand your templates by completely customizing the layout and style of the template using the editor. Add fields from Current RMS that are dynamically inserted, such as an information about the opportunity, sending user, or your company. Access the HTML & CSS that comprises a template to make advanced changes. The rest of the template can be customized completely. To view and manage discussion templates, head to System Setup > Discussion templates. A basic text template regarding document approval that includes the link to the document. A basic signature containing the logged in user’s name. A more sophisticated example layout using HTML available from opportunities. A more sophisticated example layout using HTML available from organizations. You can’t delete these, but you can edit them to make them inactive. Once inactive, they won’t be available for use. 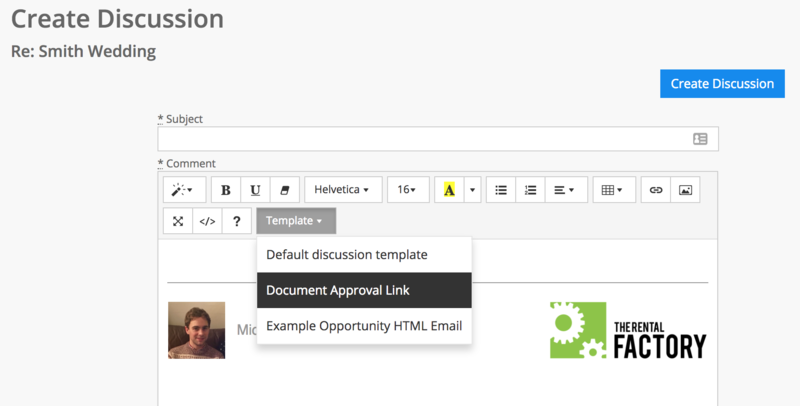 To create a discussion template, hit the green add discussion template button in System Setup > Discussion templates. You can also clone an existing template, just click the blue arrow to the right of a template in the list of templates and choose Clone. Provide a name for your template. This will show up in the list of options when creating a discussion. Your name must be unique within the context of the module. Optionally enter some text to describe this template for your reference. When will this template be available to choose? For example, if you select “Opportunity,” you’ll be choose this template when creating a discussion from an opportunity. Choose “None” to use this template on any discussion. Toggle to NO to make this template unable to be selected. Toggle to YES to mark a template as the default for the module that you’ve selected. Default templates are automatically inserted when creating a discussion for that module. Only one template per module can be marked as default. Use the editor to build your template. 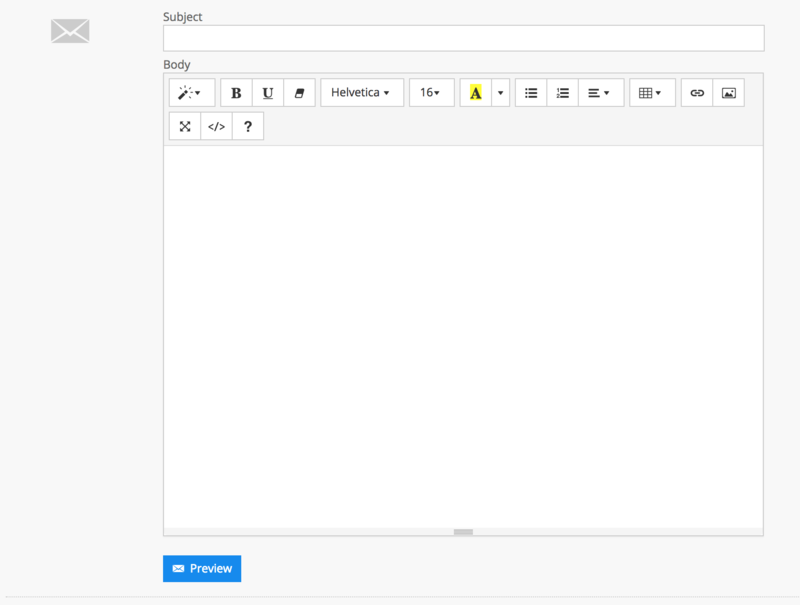 This is where you can add text and customize the layout and style of your email template. Use the options on the toolbar to easily style your text, add images, create tables, and more. Drag and drop images to add them. They’re uploaded to your Current RMS system. Drag or copy & paste content from other applications to add it in. Hit the code button (< >) to make advanced changes to the style and layout in HTML & CSS. Use the blue preview button to see how a template will look. Dummy data is used where you’ve used liquid syntax. From here you can also send a test email so you can ensure your template looks how you expect in different mail clients. This is because not all mail clients recognise class-based CSS, so inline styling ensures cross mail client compatibility. To use a discussion template, simply create a discussion as normal and choose the template you’d like to apply from the list.